that the Earth is similar to a sphere. Associated with this belief were eight invisible, transparent, concentric, crystalline spheres with the Earth at their center. The moon, sun, five visible planets (Mercury, Venus, Mars, Jupiter and Saturn) and the stars were embedded in these spheres. Thus, all of the stars other than the sun were believed to be at the same distance from the Earth. Job 26:7: "He stretcheth out the north over the empty place, and hangeth the earth upon nothing." To stretch something out might seem to imply a flat object, like a sheet. Isaiah 40:21-22 "... have ye not understood from the foundations of the earth? It is he that sitteth upon the circle of the earth, and the inhabitants thereof are as grasshoppers; that stretcheth out the heavens as a curtain, and spreadeth them out as a tent to dwell in." Unfortunately, in the original Hebrew, this passage is ambiguous. The Hebrew word "chuwg" can refer to either a circle -- like a dinner plate -- or a spherical shape -- like a globe of the Earth. Revelation 7:1: "And after these things I saw four angels standing on the four corners of the earth... "
The "four corners" of the Earth might imply a flat Earth, because shapes similar to spheres including oblate spheroids, cannot have corners. But some interpret the "corners" as simply referring to the four cardinal directions: north, south, east, and west. Most fundamentalists believe that the Bible as God's inerrant word -- without error, and that it is normally interpreted literally. Some fundamentalist Christians interpret these passages as describing a flat Earth, in the form of a circular disk. The flat Earth theory has also been picked up by many conspiracy minded persons. More passages from the Bible are discussed elsewhere in this section. 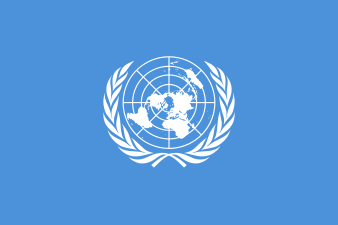 The flag's central symbol is an "azimuthal equidistant projection" (AEP) of the Earth with the North Pole in the center." This method of projecting the earth's continents onto a flat surface displays the Northern Hemisphere, to which is added that portion of the Southern Hemisphere from the equator to 60 degrees south latitude. Each of the concentric circles that appear on the map represents 30 degrees latitude. North America is shown above at the 9 o'clock position; South America at 8 o'clock; Africa at 5 o'clock and Australia at 2 o'clock. Northern Canada, Greenland, and northern Russia are shown with reasonably accurately. The shape of the land areas become increasingly distorted near the circumference. Australia, for example, is shown much narrower in the North-South direction and more than double its actual size its East-West direction than it is in reality. Images similar to this one are promoted by many believers in a flat earth as the actual shape of the Earth. To them, Antarctica is a ring of ice of unknown width on the order of 80,000 km (50,000 miles) in length. 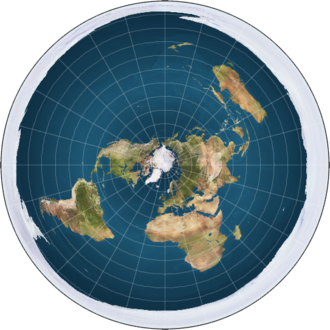 Other "flat earthers" use the same projection but say that it is only an approximate view. This video was published on 2017-JUL-16, and received over 1.3 million views and almost 17,000 comments within the first five months. It really struck a nerve! Proof 1: Australia is shown in a typical flat Earth map as a long, narrow strip of land. See the above two maps at the 2 o'clock position. However, actual maps made of Australia from real measurements on the ground show it to be much shorter in the East-West direction and wider in the North-South direction than is shown on these maps. Also, on the map, it appears longer in an east-west direction as the enitre continent of Africa is in a north-south direction. That does disagrees with real measurements on the ground. On the other hand, a typical world globe shows the dimensions of the country/continent of Australia accurately. Proof 2: The distance between Australia and New Zealand in a flat Earth map is enormous when compared to actual measurements taken crossing the water in a boat or airplane. Again, a typical world globe shows the distance accurately. Proof 3: Perhaps the first indicator of a spherical Earth ever noticed was that when a ship left a harbor and sailed away across the ocean, the ship would appear to sink into the water so that only its upper hull was visible. As it traveled further, only the sails were seen. Eventually the ship would disappear over the horizon. If the Earth were flat, one could see both the ship's upper hull and sails until it became too small to discern. (Actually, there is an optical effect called parallax that can interfere with this simplistic description). A similar observation could be seen with two lighthouses separated by, say, 50 miles of ocean. If the earth were flat, one would be able to see one lighthouse from the other with a telescope even though each structure was a only few hundred feet high. But, in reality, because the earth is close to spherical, even the top of each lighthouse would be invisible from the other lighthouse because it would be well below the horizon. About 20 other proofs that the Earth is not flat are contained in some of the following articles, along with discussions of other topics. Part 1: Overview about cosmological beliefs. The Ancient Pagan view originating in Sumer. Part 2: The revised Pagan view, as generally accepted within early Christianity. Part 3: Greek Pagan cosmology (Continued). Modern view of the solar system. Church taught an Earth-centered system. The big hoax: that the church taught a flat Earth during the Middle Ages. Part 5: Three more proofs that the Earth is more or less spherical and not flat. Part 7: Arguments about the Earth's shape. A weak proof of a spherical Earth. More Old Testament passages about the Earth's shape. Part 8: Passages from the New Testament about the Earth's shape. Additional proofs that the Earth is not flat. Part 9: Proofs 15 to 21 that the Earth is not flat. Part 10: Proof 22 that the Earth is not flat. Are Flat Earthers Hoaxters?